I’m going to try and post my radio show again, I’ll put all four up here eventually, but here’s the first night to listen to while I tell you my story in text. I’ve hosted it on my Dad’s Carpet Care webpage which is finally up too at www.arndtcarpetcare.com It’s my first try at a webpage, and I’m learning all sorts about this program I authored it on, so don’t be critical yet. We’ll polish that baby up and it’ll be sweet, I promise. Dad, it’ll get better. As promised, the radio show. Right click (or control click, you lovely Mac users) on this link and “Open in Separate Window” or “Open in New Window” or some such thing. So you can stay with me. I know. The mic was bit quiet on this first episode, but I fixed it for the last three, have no fear. When we last saw our caped crusaders they were on a bus headed for the huge, new multiplex in London… the O2 Millennium Dome. Heading south on buses going toward Canary Wharf and the Blackmore Tunnel, they find themselves stuck in 5 o’clock traffic with no minutes left to call their poor friends who hungrily await their dinner-and-a-movie dates. Transferring buses, they continue southward as the large (and totally friggin’ ugly! 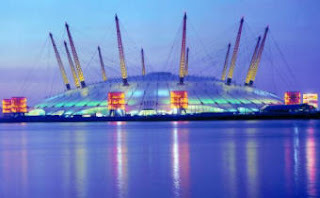 Check it out, here) O2 dome came into view. As our heroes (I guess Jamie’s a Heroine… maybe?) stared out of the bus in horror, the Blackmore Tunnel disappeared off to their left. The next stop, as the bus stopped, was it’s last stop and they were forced out into the garden of a huge building. Virtually deserted, after hours, they set out to find a phone, and finally were able to contact their compatriots. Already at the previews of the movie, it soon became apparent that the night was a failure and they were lost. Not far from a street, they came upon a hotel where they stealthily used the facilities and moved on. The night began to envelop the city and our caped crusaders were deep in an industrial area, far from happy, well populated areas and in places like this in London the night gets scary. Only one short bus transfer later and our heroes found themselves feeling much safer and much closer to home. Hungrier than ever, they stumbled upon a true British pub not far from their home base and found a large, grey-colored feline lounging in the corner. After ordering a delicious meal, well-deserved pints of the local swill, and a few good conversations with this cat (and the bartender) our heroes found themselves full and content. All in a night’s work. …Alright, I’m done talking in third-person. That cat was awesome, by the way. It wouldn’t stop staring at me when I had my food. I hope you enjoyed our little story and I hope you’re enjoying my radio show. There is four episodes of “The Classic Chronicles” and I’ll be including one for the next three episodes of the show so you get all four. As always, I really do appreciate your support. If you like my show (radio show) and want to help me out, email them. I’m trying to convince them to give me a radio show and pay me for it, so if you email them here: guestlist@offthechartradio.co.uk and tell them you like my show and want to hear more, it would help a lot.